11/08 - (Oregon) - Talent Police Chief Mike Moran said clerks at a local store stopped one senior citizen from being scammed out of thousands of dollars, and in the second case in as many days, local police are seeking help from Canadian authorities to intercept one of two other money orders now en route to Calgary, Canada. Moran said two Talent residents were called Thursday and today by a person claiming to be a relative -- a grandchild in one call and a nephew in the other. In each call the person had the correct name of the relative and claimed to be in jail and in need of quick cash. One victim was told to send a money order for $5,800, and that's the one stopped by store clerks who urged the would-be victim to make sure the relative was in need. When the senior called to check out the story, the scam attempt was discovered, Moran said. The other victim was told to send two money orders for $6,800 and $4,000. Only one of those was stopped before it made it out of the area by mail. Moran said his investigator is trying to find out how the caller knew the names of relatives, and why Talent residents were the target of this scam. He urged caution when receiving calls in which a person claiming to be a relative is asking cash to be sent. If in doubt, call other relatives to check the story or contact police. 11/08 - CINCINNATI — The FBI is warning people about a scam in which grandparents have sent thousands of dollars they believed was for grandchildren in trouble in Canada. FBI spokesman Mike Brooks said Monday that at least four households in the Dayton area and three in eastern Indiana have received telephone calls in the past week from an unknown male who claims their grandchild needs help. The caller identifies the grandchild and the child’s college by name and urges the grandparent not to contact the parents because the child is supposed to be at school. The grandparents then wire money to Canada. Brooks said the largest loss so far has been $5,000. Variations of the so-called “granny scam” have been circulating around the country for years. Brooks said the investigation of this one has just begun. 11/08 - (Maryland) - Scam artists have found a new way to prey on seniors, by pretending to be their grandchildren! It's an outrageous idea, but the Better Business Bureau says dozens of people have already complained about the scam that's costing them thousands. ABC2 News Investigator Joce Sterman tells you how to protect yourself. Wayne Kanitz and his wife don't have the disposable cash they used to, not since someone stole $5,000 dollars from them. It started with a phone call from someone claiming to be their grandson, Brandon. The caller said he and his friends were in a car accident in Canada and not to tell his parents. Kanitz says, "The voice sounded much like our grandson with the background noise and all. I said, "How much do you need?" The answer from the other end was $5,000. Kanitz tells ABC2, He said, "Grandpa, I'll give it to you as soon as I get home". And I knew he was good for it. I said, "Well, I'll have to go the bank and get the money." So Kanitz and his wife did just that, later wiring the cash to Canada. Angie Barnett with the Better Business Bureau of Greater Maryland says it's a story she's heard before, with seniors all over the country getting duped. She says, "It's pretty cold but it's a scam that works." Barnett tells ABC2 that's because the scam plays with your emotions, with the con artists knowing it will be tough for grandparents to turn down a request from their grandchild. As for the Kanitz family, when they got a second call from someone asking for an additional $6,000, they weren't fooled. Wayne says, "I thought to myself, I'm not going to send it because it was a different voice." Instead, the couple called their grandson and found out he was at work, not in Canada. They tried to stop the transfer but it was too late. Kanitz says, "We probably won't get our money back, but we wanted to let people know there's people out there that would do this. Be awfully careful, be awful careful." You need to be careful so you're not preyed upon. That's why the BBB says you should be wary of anyone calling and asking for money. Barnett says, "Don't divulge information. If you receive a call and somebody says it's your favorite grandchild, say "Who?" Come back with a question." And she also advises you to ignore requests from the caller, asking you not to tell anyone else why they need money. That's an attempt to keep the senior isolated so they won't get the truth. Instead, Barnett says you should contact your grandchild or another family member directly to get the straight story. And Barnett says that while anyone can be targeted, the BBB has heard reports the scammers are finding some seniors by using the phonebook to track down people with names that sound old fashioned. 12/08 - (Chicago) - A Park Ridge woman lost $3,600 last week after she wired money to a person she believed was her grandson. The 70-year-old woman received a telephone call on the afternoon of Nov. 25 from a man who claimed to her grandson and said he was calling from Canada where he had been in a car accident, police said. He told the woman, whom he called "Grandma," that he needed $3,600 in order to get back home, and provided her with an address where she could wire the money. The woman reportedly wired the money, but later learned that her grandson had not been in an accident and was not in Canada. When she returned to the store where she had wired the money, she learned it had already been claimed by someone at a location in Canada, police said. Park Ridge Police Commander David Keller said citizens who receive calls from someone claiming to be a family member in need of money should verify that the caller really is who he says he is before sending any cash to an unknown address. One way to do this is to contact other family members or ask the caller for personal information to verify his identity. 11/08 - (Florida) - Another woman has fallen victim to the so-called “grandparent scam” here in Southwest Florida. This time, it was a 75-year-old Estero woman. Edna Davis reported to Lee County Sheriff’s deputy Rocky Graziano that around 2 p.m. on Nov. 21, a young man saying he was her grandson called to say he was in Toronto, Canada, had been arrested for DUI, and needed nearly $4,000 to post bond. The caller went on to say he did not call his mother, in Michigan, because she would be upset. The caller then gave Davis instructions on how to make the deposit at a Wal-Mart for the money to be shipped. Davis followed the instructions, and even paid a $72 service charge to Wal-Mart. “The victim said on Monday, 11/24/2008, after reading a story in the paper about scams, she called her daughter in Michigan and found out her grandson was fine and in Michigan and was never out-of-town,” Graziano reported. There are people who believe you can’t keep warning a toddler a stove is hot and not to touch it. They say you let the child touch the hot stove and she learns not to touch it again. I’m advocating something similar be done with a scam that’s proliferating in our area. We’ve all given warnings about wiring money to Canada to help a relative — me, the Lee County Sheriff’s Office, the attorney general and my colleague Rachel Myers — but people continue to get duped. 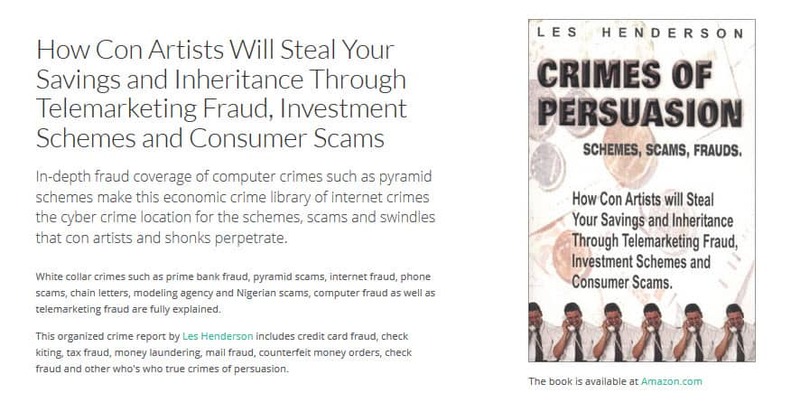 So I’m enlisting the help of readers to see if by practicing the scam on older friends and relatives they can learn. The grandparent can’t quite catch the voice but says the name of the grandchild most likely to call, “Billy,” for example. With a name to work with, Fake Billy proceeds to weave a tale about being in Canada where he’s been either arrested or in an accident or both. And he needs his grandparent to wire him some money. Sometimes Fake Billy will enlist the help of a fake police officer. Let’s call him Officer Dudley. Officer Dudley is older and authoritative. And, with Officer Dudley taking over, grandpa doesn’t have much chance to talk to Fake Billy, hear his voice, ask personal questions and figure he’s not who he says he is. Officer Dudley tells how much it’s going to take to get Billy out of jail, usually $2,000 to $8,000. And he gives the grandpa instructions on how to wire the money and get a reference number so it can be picked up. Once the money has been wired, grandpa might start checking out Billy’s story. He’ll call Billy’s parents and find out that Billy is not in Canada. He’s sitting at home in Omaha. So you’re thinking this would never happen to me, or my spouse or my parents. We’re too smart, street-wise and savvy. But smart, savvy people panic and don’t think straight when they get this call. It works through the element of surprise. So here’s what I want you to do. Try this scam out on a friend, relative or spouse. See if he or she falls for it. See how far she will go before you call it off. I know I’m going to get a lot of criticism for encouraging people to play a mean practical joke. And I wouldn’t advocate this except that I did it on my own dad a few weeks ago and it worked. I called and all I said was “grandpa.” My dad answered with my niece’s name and I was off. I was half-crying and talking fast and he listened and tried to calm me. He began to discuss how he could get the money. When he discovered it was a ruse, he wasn’t angry. In fact, he laughed at his foolishness, realizing how much information he had given me and how close he would have come to being a victim had this call really come from a scammer in Canada. My dad is a retired police officer — skeptical by nature and training — yet he didn’t ask me one question a scammer wouldn’t know how to answer. I didn’t even have to come up with his name. I just called him grandpa. “You had me,” my dad admitted. And I admit, I felt bad. But I’ll tell you what. If my dad ever gets a call like this again from a real scam artist trying to steal his money, he’s going to remember touching this hot stove and he won’t do it again. York County hit again by granny scam - woman bilked out of money through wire fraud transfer. Another York County resident was bilked out of money in a wire fraud scheme known as the "grandma scam" -- this time an 85-year-old Chanceford Township woman. The woman received several calls over a four-day period from someone claiming to be her grandson, pleading for money because he was in trouble in Canada, according to state police in Loganville. The scam artist told the grandmother he was arrested in Canada and needed money to pay his legal bills, police said. The woman wired the person an undetermined amount of money through Western Union. "These scams are not that uncommon. They take different shapes and forms but unfortunately have been around," said Trooper Tom Pinkerton, state police spokesman. The more recent twist is using a heart-felt approach to get money posing as a loved one, often targeting the elderly, police said. They ask for money because they were arrested for DUI, need car repair, have been in an accident, have been cited for traffic violations or are being held by customs. The Chanceford Township woman is at least the fifth York County resident to report falling victim to the scam. Spring Garden Township Police and Southern Regional Police are investigating similar scams. The scam has been around for years and has been perpetrated across the state and country, said Nils Frederiksen, deputy press secretary for the state Attorney General's Office. of the victim, he said. The victim often does not verify the story with other family members or police or law enforcement agencies. Once the money is sent, it is nearly impossible to recover, Frederiksen said. And because these scam artists are transient, they are difficult to track down, he said. "These are individuals who make their money as storytellers or actors. They make money by talking you out of your money. The ones who are good are very good at it," Frederiksen said. Police and law enforcement officials recommend verifying any request for money with the respective law enforcement agency and other family members. Two Spring Garden Township residents fell victim to the scam in October, Sgt. David Jay said. In both cases, the victims sent an undisclosed amount of money to help someone posing as their grandson who was arrested in Quebec, Canada, for drunken driving, he said. The victims felt obligated to help a family member in need, he said. Jay suggested that anyone who gets a suspicious call to contact police immediately. After contacting local police, Frederiksen urges victims to call the Attorney General's Bureau of Consumer Protection at 800-441-2555. Most of the crimes involve interstate and international scams, and the AG's office works with other states, the FBI and the Secret Service through the U.S. Treasury. Frederiksen warns that scam artists often target the same victim and have developed what is known as "sucker lists." "They will come at you again and again and again until you give up or until they have exhausted that supply of money," Frederiksen said.